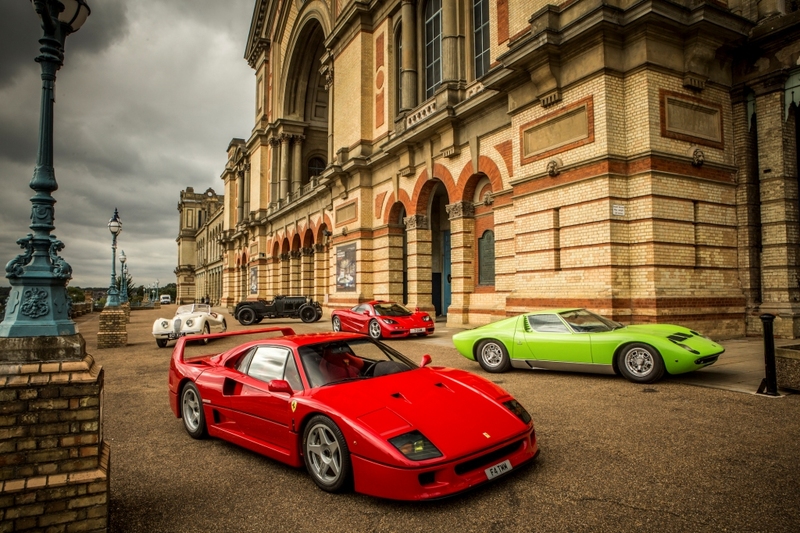 Seven of the greatest supercars of the past century have gathered at Alexandra Palace for a sneak preview of the unmissable automotive feast that is The Classic & Sports Car Show, which takes place at the famous landmark just a month from now on 28th to 30th October. A Bentley 4 ½-litre Blower, Jaguar XK120, Mercedes-Benz 300SL ‘Gullwing’, Lamborghini Miura, Ferrari F40, McLaren F1 and P1 were photographed outside the stunning venue and are among the finalists for the ‘Century of Supercars’ display that will form the centrepiece of the show. All 11 finalists, decided by public vote chosen from categories defined by the decades, will be on show at Alexandra Palace at the end of the month, when the winning car will be revealed. To vote, visit www.classicandsportscarshow.com/supercars and pick the car you think deserves the crown. Everyone who votes will be entered into a draw to win a pair of places on the VIP show tour. The supercar theme will be just one of many stand-out displays at an event that will feature more than 300 classic cars from world-famous collections and specialist retailers. 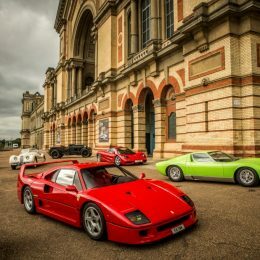 For the first time, live parades of famous cars will take place around the grounds of Alexandra Palace during the three-day show. Collections featuring stunning supercars and cherished historics will run twice a day, starting from the Grove area of the palace, accelerating past the Palm Court entrance and gliding along the picturesque South Terrace, in front of the venue’s famously elegant exterior. Stars of the classic and motoring world will appear on the Live Interview Stage presented by Goodwood Road & Racing during the course of the show. A new partnership with the organisers of the Sussex circuit’s celebrated Members’ Meeting, Festival of Speed and Revival Meeting will ensure a stream of familiar faces, to be quizzed by Goodwood’s regular presenter and commentator Henry Hope-Frost. Among the names already confirmed is Norman Dewis OBE, the legendary Jaguar test driver who played a key role in the development of the British manufacturer’s ground-breaking sports and racing cars from the 1950s to the mid-1980s. Now a spritely 96, Dewis remains a motoring raconteur of unequalled repute when he recalls his years of experience behind the wheel, from the first experimental runs in C- and D-types to surviving the crash that destroyed the unraced XJ13 at MIRA in 1971. One of Jaguar’s rarest cars, the unique 1954 XK120 by Pininfarina, will be displayed at Alexandra Palace in a unique way. Normally we only get to see the start and end of a restoration – but world-leading specialists from Classic Motor Cars (CMC) will present this amazing vehicle part-way through its restoration. Once considered to be lost, the car is believed to have been created for US importer Max Hoffman and was displayed at the 1955 Geneva Motor Show. It will be making its first public appearance for 40 years at the Classic & Sports Car Show. 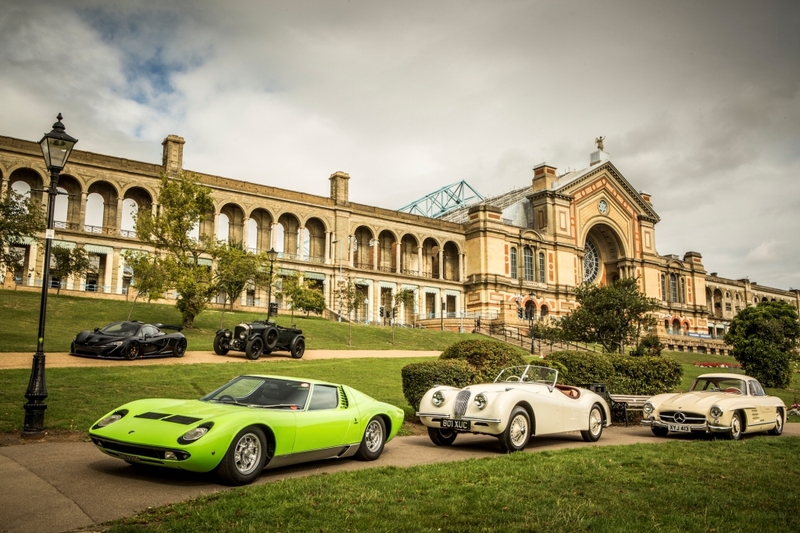 Visitors to the Classic & Sports Car Show will face the tempting prospect of returning home with a new addition for their garages following confirmation that Coys of Kensington will host an auction at Alexandra Palace. Billed as ‘an important auction of fine historic automobiles’, the sale is due to take place on the Saturday of the show (October 29) and promises to feature a range of special consignments. The auction will be an important feature of the weekend as the show enters its second year. 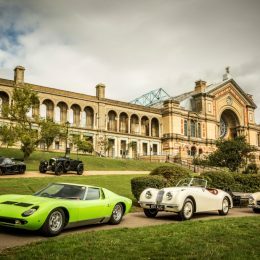 James Elliott, Classic & Sports Car magazine group editor, said: “It’s fantastic to see Alexandra Palace play host to some of the world’s most pioneering cars – these pictures really capture the essence of the Classic & Sports Car Show experience. “These seven incredible cars show just how the supercar has evolved over the last century – and, incredibly, they are just a snapshot of our Century of Supercars centerpiece feature. With 11 of the world’s most amazing supercars in the Great Hall from 28-30th October, visitors will be treated to a proper feast for the senses. I can’t wait to see which car people will vote as the ‘Greatest Supercar Ever’. The organisers would like to thank to Stanley Mann Racing (www.stanleymann.com), Jaguar Heritage (www.jaguarheritage.com), Hexagon (www.hexagonclassics.com), JHW Classics (www.jhwclassics.com) DK Engineering (www.dkeng.co.uk) and McLaren (www.mclaren.com) for the loan of the seven cars. Tickets are now on sale, visit www.classicandsportscarshow.com to book yours.